...and this could just be the beginning as Malaysian organiser Jonathan Quek are considering a series of Malaysian events (with the potential to attract players no just from Malaysia but also from its neighbouring countries, such as Thailand, Burma, Singapore and Indonesia) that will finally lead up to an international "Malaysian Open" (with features that should be attractive for the European top players!) within the near future. 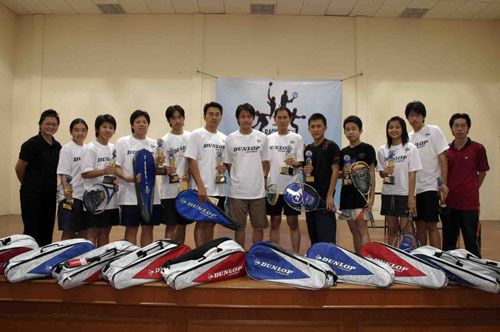 Co-organiser Aaron Chee reports below from the Dunlop INTI Racketlon Challenge. 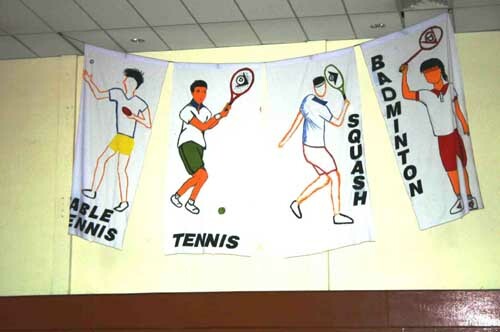 Anxiety, tension and excitement had filled the air in INTI College as the very first racketlon tournament was to be held. 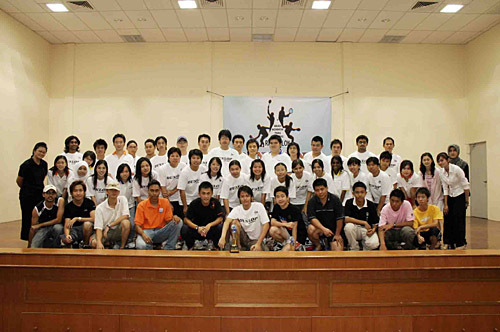 Participants from in and out of inti had started arriving at INTI College Malaysia at 3.00pm on the 8th of June 2006. The brain child of Jonathan Quek, the squash club president, had been finally put into motion. Having worked on this for more than 4 months, he and his team had been more than motivated to get this show on the road. Having worked their hearts and sinew into this, they were not willing to accept defeat. The competition was separated into two categories for each gender- Men A, Men B, Women A, and Women B. Each category, despite its class, had brought forth the young talents to the lime light. Although having just joined for the fun of it, many participants had impressed the audience with their playing styles and, not to forget, elite sportsmanship. This event had gotten a certain radiance by the presence of sporting icons such as Kenneth Low, the ex Asian squash champion. Having set foot into the battle field, many players had become jittery. Nevertheless, none backed down. They fought the battle til the very end. The winners. Including tournament director Jonathan Quek (in the centre with both hands behind his back). The champion for the Mens category A was Tey Pin Siong and the 1st runner-up was Roger Ong with the 2nd runner-up Richard Yap. As for the class A Womens the champion was Beh Lee Wei and the 1st runner-up was Beh Lee Fong. The class B Mens was championed by Lim Wei Ming followed by Chong Yoon Woon as the 1st runner-up and Tan Jey Sern as the 2nd runner-up. Class B womens category had Loh Gee Woon as the champion and Audrey Tan as the 1st runner-up. Ed's note: The winner of the Men's Elite class Tey Pin Siong (who knocked out Aaron Chee in the quarters and Kenneth Low in the semis) won the final in an unusually convincing manner before the squash was even finished(!) by +32 (tt:21-0, ba:21-4, sq:5-11, -). Aaron Chee reports that his table tennis was "at least national level" and his badminton "at least state level". Age 30. European players might get very familiar with this name - and others - as a Malaysian team is expected to take part at the next World Championships (in Rotterdam, Holland?? ?, December 2007???). Having created champions of different degrees, the tournament had come to an end on the 11th of June. Once again, Jonathan and his team have set their mark in the Malaysian book of records and for the first time in the international arena, for this is indeed the very first racketlon challenge in South-east Asia! Hats off to those great efforts!!! About 100 players from 6 different countries took part in this event. Not bad for a first pilot!